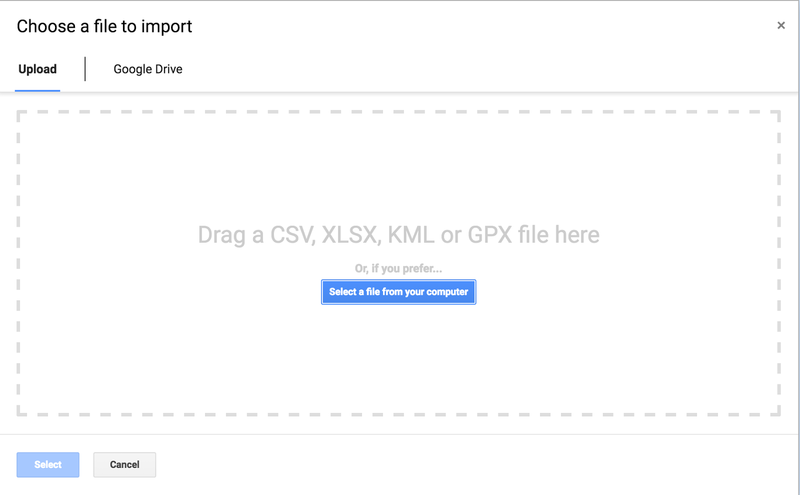 Below is an overview on how to import data into a Google My Map. Once you have mastered this skill there are numerous practical uses to explore! 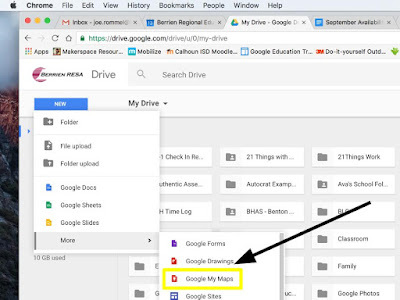 Google My Maps are part of the 'More' panel within the 'New' button of Google drive. After you press the import button, you are prompted to find the file you would like to use. As you can see in the image .csv, .xlsx, .kml, or .gpx files may be used - or a Google Sheet from your Google Drive. Spreadsheets with concise column headers work best. 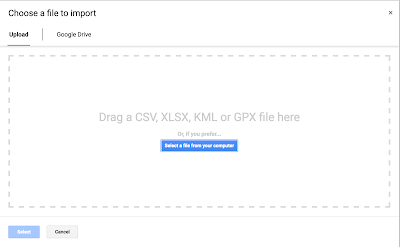 I imported a Google sheet from my Drive. 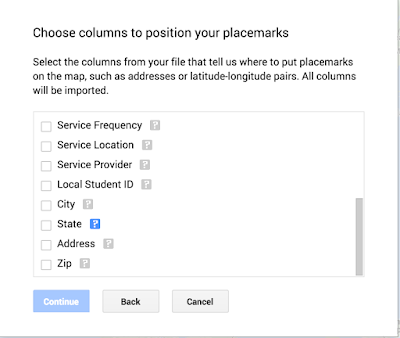 The column headers show up with a checkbox next to them. 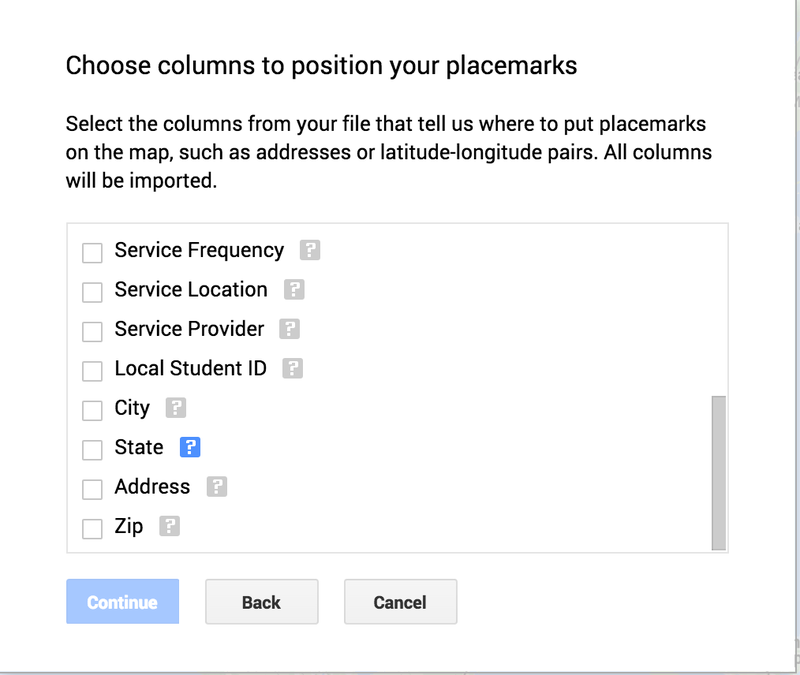 The first step now that the data has been linked is to choose where the placemarks will be placed. You are able to select multiple columns. In this example I selected city, state, address, and zip. 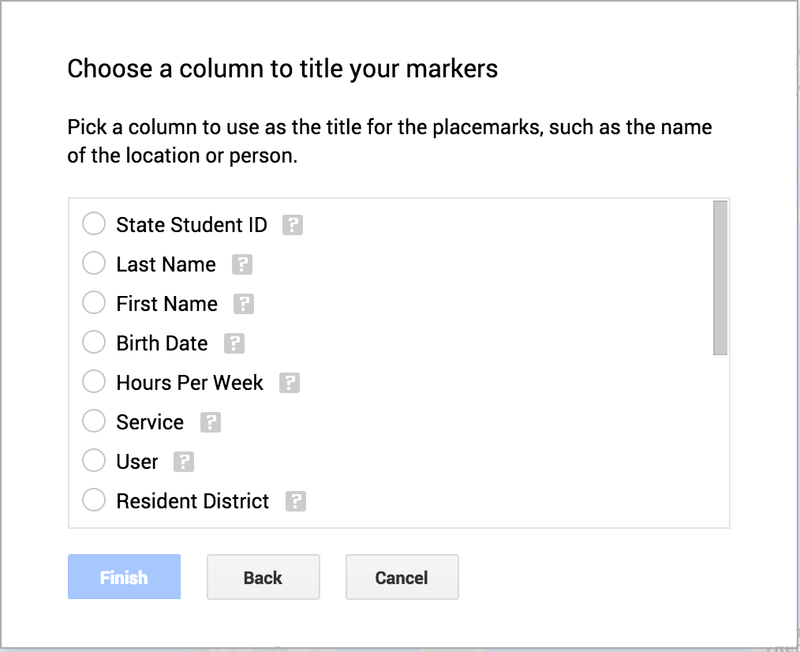 The last option before the placemarkers are set is to choose how each will be identified. 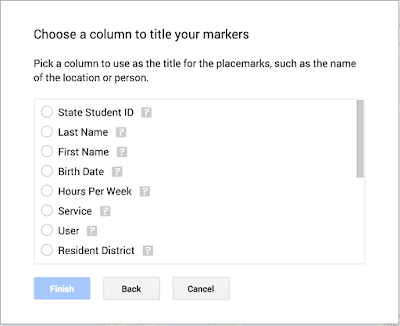 You are able to choose one column header to use as a title. I chose first name in this example. Here is what the finished map looked like based on the data that I imported. I was alerted that there were several rows unable to be mapped - I went in and checked for grammar and was able to resolve this issue. I could also have chosen to place the pins manually by selecting one from above and placing it where I wanted. 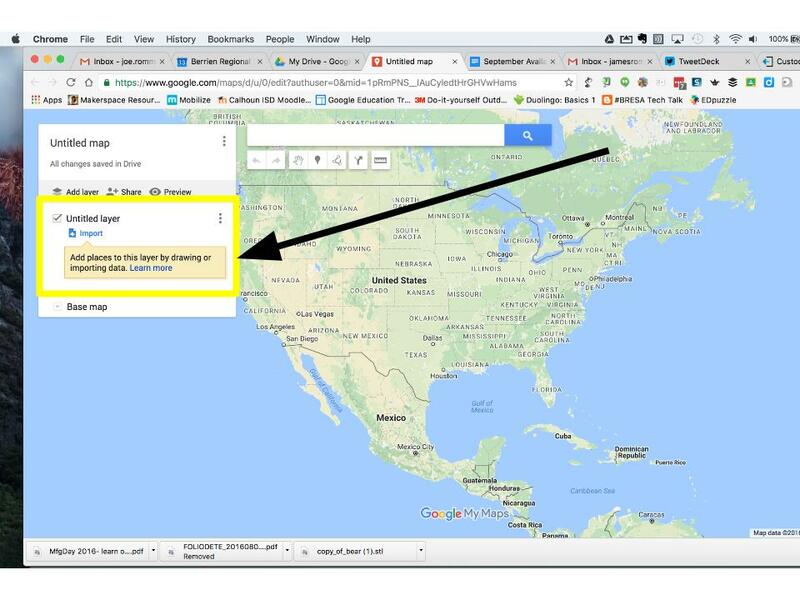 Google My Maps provide a great tool for building geographic awareness. Students could create a walking tour of their local area, visit far away lands, or something in between. 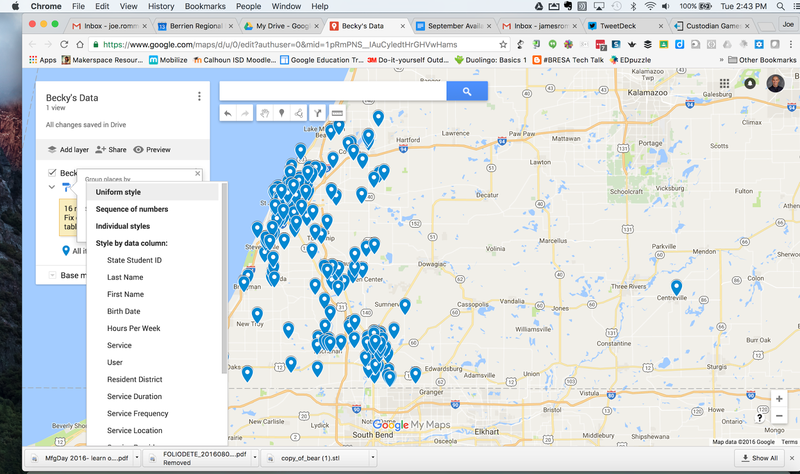 A school leader might map all their student addresses to find the most efficient drop off points for transportation. A therapist that conducts home visits may use my maps to create a visual guide for planning their travel. A manager of several employees may map their caseloads to find an equitable geographic balance. Google My Maps are even accessible within maps.google.com so not only can you create the perfect road trip, you can also follow it. Google My Maps are another tool for your arsenal, one I encourage you to dig into today! The health care system of the USA faces essential challenges that points to the urgent need for reforms. Health care remains the world’s more expensive in America, spending more money per capita on health care than other countries. The costs of health care for business are escalating quickly, quicker than profits from increased productivity and inflation. The public sector faces the same problem of increasing health care expenditures, being the second fastest growing component of a federal budget. argumentative essay on health care reform for more details. Hello! I just read this information and i can tell you that this article is useful. Thank you for sharing it. Look at this please - https://speedypaper.com/rate-my-paper-online.